The deal is done, the press conference scheduled for this afternoon, and Mike Shanahan is now the coach of the Redskins for the next five years, or until Dan Snyder gets impatient. 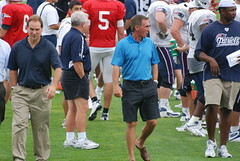 Shanahan will also have some control over the roster under the deal, something that only Coach Gibbs was given before. The deal will pay Shanahan $7M per year. Bonus, now the Broncos don’t have to pay him for the next two years. Thanks, Snyder! Actually, the Skins are only picking up half the Broncos obligations for 2010 and 2011!